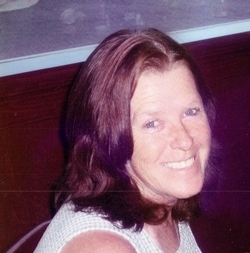 Jesup- Linda Kay Goins, 50, passed away Thursday, May 3, 2012 at the Altamaha Healthcare in Jesup after a short illness. She was born in Wayne County and had lived in Jacksonville, FL most of her life, returning Jesup to six years ago. She was a loving mother, "Nana", and daughter and she attended Parkway Church of God. Her mother, Betty Jean Kent Hall, preceded her in death. Survivors are her daughter, Jena Crews of Sanderson, FL; her son, Billy Goins, Jr. of Jacksonville, FL; her father, B.J. Hall of Jesup; two sisters, Suann Andrews of Alma, Missy Atkins, and a brother, Timmy Hall, both of Jacksonville, FL; grandchildren, Shayla Crews, David Crews, Riley Crews, and Hana Goins; several nieces and nephews also survive. Visitation will be Friday, May 4, 2012 from 5-7 pm at the funeral home.